This post is a bit of a rant and a curiosity at the same time. I've noticed an abundance of folk lately inquring at work, as to whether or not we sell wall stencils (the answer is no, just in case you were one of those folk). From my experience, of being a product of the mid-80s, stenciling was essentially a floral border painted along the top or mid section of a wall. It was a means of being different, without being too flashy. Fast forward 20 years, and somehow, stenciling is cool again. It's the next step in the feature wall/ wallpaper/ wall decal evolution. The problem with wallpaper is that people want the flashy design, but are terrified of getting a sheet of paper wet, and hanging it on their wall. Painting a stencil, on the other hand, is a more managable task for some. The beauty of stenciling is that it's done with latex paint, and if you don't like it, or grow tired of the look- you can simply paint over it. Modern stencils feature large, continuous pattern that make quite the statement. 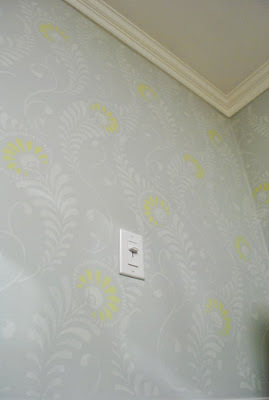 Most stencil-ers will argue that stenciling is much more cost effective than wallpapering. And while that may be true, stenciling can take up to double, if not triple the time! For example, recently on a blog I follow (Young House Love- go check it out! ), these 2 DIYers decided to stencil their entire office (from the chair rail and up). While the entire project only cost around $70, it took them 13.5 hours to complete the entire project! While I admire their dedication to the project, I'm still stunned by the amount of time the stenciling took. If I were to ever invest that much time in a stencil, I literally don't think that I could ever bring myself to paint over it. Given the choice between the stencil and wallpaper, I'm still likely to choose the wallpaper. But for a small project, I think I may just have to give the stencil a try!